After releasing Huawei Honor 8 late last year 2016, Huawei has announced yet another device which is the successor to the Honor 8 called Huawei Honor 9. This phone will be coming in two versions, which are the 64GB internal memory + 6GB RAM and the 128GB internal memory + 6GB RAM. Though, both supports microSD card of up to 256GB (uses SIM 2 slot - Nano SIM). 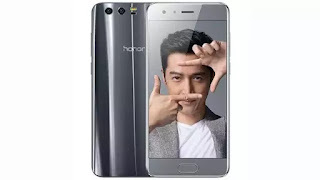 Huawei Honor 9 has a 5.1 inches touch screen, 4G LTE enabled, fingerprint scanner which is mounted in the front, runs on Android 7.0 Nougat and powered by HiSilicon Kirin 960 chipset. That's not all, this phone boasts of Dual rear cameras 20MP + 12MP with Dual LED flash too, and also 8MP front camera with no Flash. Kindly see the full specifications and price of this phone below. Price in India INR 22,000 / United states $342 / China CNY 2,321 / Nigeria N108,000. All these heavy battery eating specs and all they put in it is 3200mah. Smh.